Discounttime Ads might flood your Internet Explorer, Google Chrome, and Mozilla Firefox browsers if an advertising-supported application slithers onto your computer. 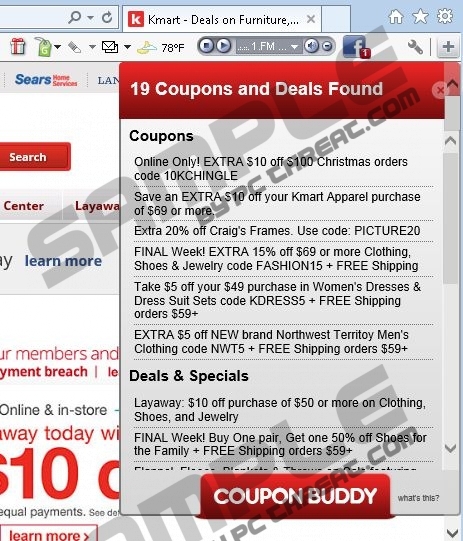 According to our specialists, it is very likely that a version of Coupon Buddy adware, which travels together with Conduit toolbar, displays Discounttime Ads. You will be able to get rid of Discounttime Ads if you erase adware and other unreliable applications from the system. Unfortunately, it might be difficult to detect them, which is why we suggest that you use an automatic malware remover. If you want to try the manual removal, you should definitely use our manual removal instructions for this matter. In most cases, you will notice Discounttime Ads on various online shopping websites, including ebay.com, amazon.com, bestbuy.com, and walmart.com. You might think that all these coupons and deals might help you to save money while shopping online; however, that is not true at all. The researchers at pcthreat.com have carried out research which reveals that Discounttime Ads might redirect you to unreliable websites. There is a possibility that they will contain malware, which means that you might easily infect your system. Malware tends to slither onto the computer very quickly; thus, you should ignore all those Discounttime Ads and definitely not click on them. Ads are not only very annoying, appearing at the most inappropriate time, but also might disrupt your browsing session. In addition, the adware program responsible for the presence of commercials will collect non-personally identifiable information in order to provide you with personalized ads. Discounttime Ads are also based on your interests; however, it does not mean that it is safe to click on them. Therefore, you should hurry to delete an advertising-supported application from your system. In order not to allow adware to enter your system in the future, you should install an antimalware tool and keep it enabled. The only way to stop Discounttime Ads from appearing is to detect and delete the application that is responsible for their presence. It is very difficult to detect all the unreliable programs that hide on your system, which is why we recommend that you scan your PC with an antimalware tool, such as SpyHunter. You will only have to click the Fix Threats button and it will delete all the existing infections. On top of that, it will protect your PC from future threats as well. Open it and click Uninstall a program. Quick & tested solution for Discounttime Ads removal.